St. Lucia is home to us and (during hurricane season) to Queen Emma. We kept Eaux Vives on the hard in the boat yard at Rodney Bay for many years before that.. Every time we return, it feels like returning to family. Now that we have made so many friends here, Queen Emma will still slumber through hurricane season here. It is considerably more expensive than when we first visited and no where near as homey, but... better the devil you know. The advantages of St. Lucia: good airport, nice good people and from here it is usually a reach sailing either north or south. The jump-up in Gros Islet is famous and Castries has a spectacular market. The south end of the island is relatively uncrowded and has some of the best windsurfing and beaches in the Caribbean. 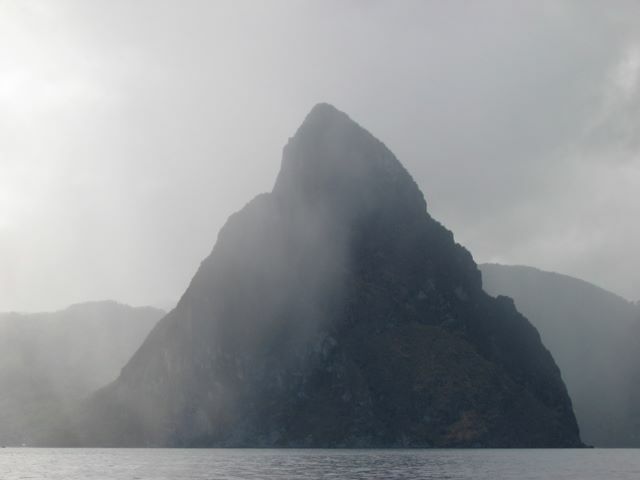 The Pitons (shown below) gave their name to the local beer and they offer spectacular climbing, hiking and views.